Being in Austrian Alps and not trying canyoning would be definitely a lost chance for us. Mountains are great place for all kinds of sport but, obviously, it’s not possible to try canyoning everywhere. And Austrian Alps are perfect place for that. 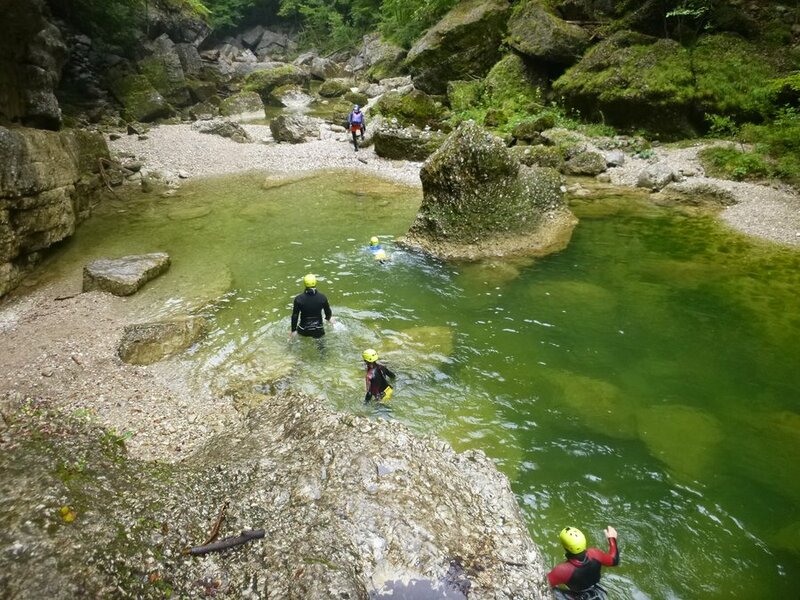 Beautiful gorges, breathtaking views and lots of adventure companies – it all makes Alps perfect destination for canyoning aficionados. OK, now a few words of explanation what canyoning really is. It’s adrenaline-inducing, action-packed water sport which combines trekking, swimming and jumping from rocks into the cold, mountain water. Canyoning also includes a small amount of climbing but it’s rather easy because the trail's adjusted with iron steps, ladders, etc. All this is done in gorge. Of course, special wetsuit's indispensable to practice this sport. First things first – to try canyoning you need to like adrenaline . I’m not saying it’s only for superfit tough cookies – in my group there was people of all ages - children, middle aged women, etc. The thing is that you need to feel comfortable with water and height. I didn’t. And I wonder if I’ll ever try canyoning again. Next thing – it’s no fun for short-sighted people . I had grave myopia at that time so I needed my glasses but I was forced to keep them in my wetsuit. They would definitely not stay on my nose when I hit the water surface. I got stressed out that they’ll get broken because of the impact of hitting the water surface but, fortunately, neither myself nor my glasses got broken. The other thing which made canyoning very challenging for me is that I’ve never practised jumps into the water . When I was a child I was constantly told not to jump. “Don’t do it - you’ll break your neck for sure!”. “Jump and you’ll spend the rest of your life in wheelchair”. And so it went. Having heard so many threats (said, of course, in good faith, pure bona fide) and never actually trying to jump into the water made me uncomfortable while doing canyoning. Our guide kept repeating “Active jumping, do active jumping!” but it didn’t help me much – I know for sure my jumps were anything but active. I can still remember my legs shaking and my heart pounding heavily when I stood at the high rock, unable to see properly and wondering if I’ll jump correctly to hit the water in the right, deepest point. I think I reached my adrenaline limits by then. I don’t even mention my poor comfort zone – that was forgotten at the very beginning when I got into the cold and damp wetsuit. All in all, I value this adventure a lot. Besides making me proud of myself (felt like a war hero afterwards! ), canyoning showed me how far I can go with risky stuff . It’s always nice to get to know yourself. Besides, being light years away from my comfort zone was worth trying and is definitely memorable experience which I’ll be telling about my friends and family for long years. But I’m not sure if I’ll try this sport again – I feel it’s not worth all the stress it caused and I’d rather use my time in the mountains hiking via ferrata trails or biking. Have you ever tried a sport which made you tremble with fear?